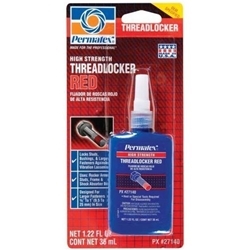 High strength threadlocker for heavy-duty applications 3/8 inch to 1 inch (10mm to 25mm). Especially well-suited for permanently locking studs and press fits. Adds 3,000 PSI holding power on slip and press fit assemblies. Replaces set screws and snap rings. Locks against vibration loosening. May require heat or special tools for removal. Conforms to ASTM D5363 AN0221 (Mil-S- 46163A, Type I, Grade K).